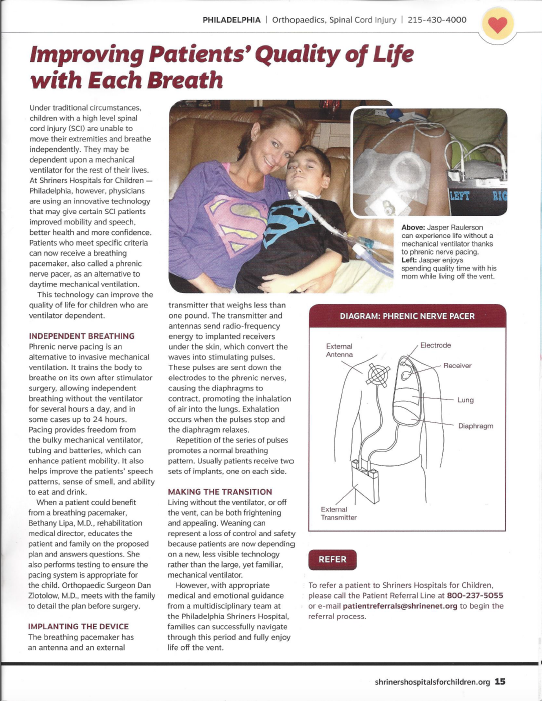 Improving Patients’ Quality of Life with Each Breath - Avery Biomedical Devices, Inc. Under traditional circumstances, children with a high level spinal cord injury (SCI) are unable to move their extremities and breathe independently. They may be dependent upon a mechanical ventilator for the rest of their lives. At Shriners Hospitals for Children —Philadelphia, however, physicians are using an innovative technology that may give certain SCI patients improved mobility and speech, better health and more confidence. Patients who meet specific criteria can now receive a diaphragm pacing system, also called a phrenic nerve pacer, as an alternative to daytime mechanical ventilation. This technology can improve the quality of life for children who are ventilator dependent.